For the second year in a road, the Atlantic Seaboard Wine Association (ASWA) was hosted at a dinner at the home of the Ken and June Spadoni in Dry Creek Vally in Sonoma Valley California, It was an honor for the Association to present winning wines from its eleventh annual wine competition to an interested party of attendees hosted by the Spadonis. 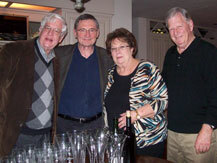 In the photo, on the left is ASWA President, Carl Brandhorst next to ASWA Vice President, Grant Crandall next to June Spadoni with Ken Spadoni on the far left at the end of the evening. 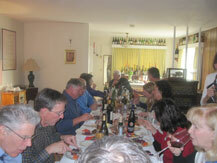 The wines presented that evening for their enjoyment and the enjoyment of their guests are listed below. The guest list is included below. 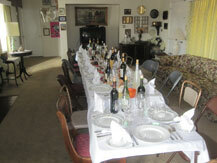 The guests have arrived and have started the luncheon at Ms. Anne Vercelli’s in Healdsburg, CA. Ms. Vercelli is the West Coast Representative of the Atlantic Seaboard Wine Association. Down the left hand side of the table is Mike Dunne write for the Sacramemnto Bee, Nick Frey, former Director of the Sonoma County Grape Commission, Dan Barwick owner and wine-maker at Paradise Ridge Winery in Santa Rosa, Steve Garner, talk show host on KSRO and Debra del Fiorentino Director of Competitions for Vineyard and Winery Management magazine. 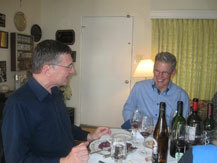 At the head of the table is Carl Brandhost, President, Atlantic Seaboard Wine Association talking to Debra. Atlantic Seaboard Wine Association Board member, Grant Crandall ( left) talking with Mike Dunne (right) of the Sacramento Bee about the east coast wines being served at the luncheon. Mike was very interested the wines and took several pictures for use later in his articles. At the end of the luncheon before everyone depart a small group photo was taken with the ASWA team members and several guests. In the front room from left to right is Carl Brandhorst, ASWA President, Ms. Vercelli, ASWA West coast Representative and Grant Crandall ASWA Board member. In the back row from let to right is Angie Frey, Nick Frey former Director of the Sonoma Grape Commission, Tim Fish, writer for the Wine Spectator and his wife Peg Melnik wine writer for the Press Democrat newspaper. 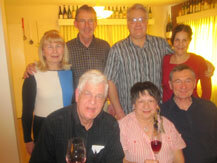 The Atlantic Seaboard Wine Association’s (ASWA) West Coast Representative, Ms. Anne Vercelli, hosted a luncheon on 1 February 2015 at her home for the association to highlight wines from the 2014 July ASWA competition. Ms. Vercelli lives in Healdsburg, CA and is a culinary instructor at Santa Rosa Junior College as well as a food and wine judge in various Sonoma county competitions. ASWA President, Carl Brandhorst and ASWA Board Member, Grant Crandall were in attendance. Ms. Vercelli’s goal was to invite grape growers, members of the media, wine judges and resort owners to sample east coast wines. Attendees included Steve Garner, KSRO talk show host and his wife Nanette, Mike Dunne of the Sacramento Bee newspaper and his wife Martha a wine judge, Dan Barwick owner and wine-maker at Paradise Ridge winery in Santa Rosa, Tim Fish a writer for the Wine Spectator and his wife Peg Melnik ,wine writer for the Press Democrat newspaper, Jeff Collins, General Manager of ASTI winery and his wife Tammy a wine-maker and winery consultant in Sonoma and Napa, Debra del Fiorentino, the Director of Competitions for Vineyards and Winery Manangement magazine and Nick Frey former Director of the Sonoma County Grape Commission and his wife Angie. It was a full house. Eighteen award winning wines from the recent ASWA wine competition were presented along with an 10 course meal with tray passed hors d’oeuvres and a staff of two serving the meal for 15 people.